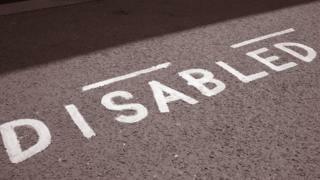 Viewpoint: Is it time to stop using the word "disability"? After running a campaign to urge toy manufacturers to include disabled characters in their collections, Rebecca Atkinson started to wonder if the word "disability" might also need a positive makeover. Cripple, deaf-mute and lame all fell out of favour a long time ago and are now considered insults. By the 1980s and 90s "handicapped" was gradually replaced with "disabled" as a new way of thinking about disability emerged - called the social model. Attitudes change and as a consequence so does language. Recently there has been a shift towards person-first language and now "people with disabilities" is often more popular in general usage over its predecessor "disabled people". I have noticed too that people in the disability community sometimes like to emphasise the "ability" part of the word with hyphens or capital letters: dis-ability or disAbility. In April this year I started an online campaign urging the toy industry to include positive representation for the 150 million children worldwide with disabilities. I began making-over toys by marrying princesses with guide dogs or wheelchairs and giving hearing aids to fairies to create a fun and colourful disability aesthetic. I took photos of my creations and posted them on the web under the name ToyLikeMe. Changing parlance will do nothing if there is not a shift in attitudes towards disability. The images conveyed not a shred of pity, no hint of inability, no inkling of dependence - the many things that people associate with the word disabled. It went viral and, what had started as a hobby, soon gobbled up my life. I quickly found myself writing post after post on the subject, late into the night. But as I typed the d-word again and again, I started to see it in a new light. It felt like a great lump of a word, stout, ugly, cumbersome and dour. Whilst it conveyed the meaning, it did not carry the modern or celebratory sentiment I wanted. It seemed to focus on the negative when the toys I was creating were singing with fun and colour. For the first time I began to wonder if "disabled", had become outdated, and needed a replacement. If we don't use the term disabled, though, what do we use to describe someone who has an impairment to set them apart from the majority? Reading posts from my followers, many of whom are parents of disabled children, I noticed the words and phrases they use: special needs, differently-able, different, ability not disability, inclusive. It seemed many people were choosing not to use the d-word, or were trying to divorce the "dis" from the ability. The definition of "dis" in one English dictionary is to "have a primitive, negative or reversing force". To discredit. To disengage. And in recent parlance "diss", with an extra s, has been popularised as an abbreviation of disrespect - "Don't diss me." "Dis" is not a thing that many people want prefixed on their child or themselves. It is, after all, inherently negative. One adult follower wrote to me in outrage after I posted an image of a toy with a facial birthmark under the banner "dolls with disabilities". "I am not disabled," she wrote, as if the term was highly offensive. "I have a port wine stain and although it's nice that you create a doll with a birthmark, I think it's a poor choice of words..."
"A disability is "a physical or mental handicap, especially one that prevents a person from living a full, normal life or from holding a gainful job," she continued. "I have a normal life. I am a teacher. I think you should seriously reconsider the use of the word." I read her message and agree you should be able to choose your own identifying label but I wasn't sure how to take her rejection of disability. She sees it as separate from the idea of living a "normal life" or having a "gainful job". But, looking at the many disabled people I know and have worked with, they do have these things. Perhaps a facial disfigurement or birthmark isn't a disability but, for many people, constant stares and negative remarks are disabling, and I feel there is still a need for children growing up with these differences to see themselves reflected in the toy box to help build self-esteem. So I began to search for a catch-all term that could be used to describe disability but also include those who wanted dolls with glasses, eye patches, birthmarks and scars - differences that do not always fit under the d-word banner. The comedian Adam Hills has a part of his leg missing and, in an interview with the Guardian in 2012, declared "mutant" a much better word than "disabled". "It sounds so much cooler," he said. I have sympathy with this, my sister and I have long referred to me as a mutant in private but I wasn't sure this level of irony would work for everyone. The phrase "disability and difference" sprang to my mind as a replacement but felt a little wordy, overly PC and problematic. Humans, after all, are all different from one another so where does normal human difference end and disability begin? Disability is a delicate flower around which the public tread with care. People with disabilities are used to being described as unable or hailed as an inspiration but may dislike both. So are disabled people "special"? Or do they span the spectrum of human life from talented to mediocre just like all humans? And does a benign descriptive word, free from negative connotation, actually exist? The bio-etheticist Rosmary Garland Thomson came near to a solution when she spoke in April this year of disability as a form of "human variation" arguing that disability should be understood as a reality to be accommodated, not a problem to be eliminated. Human variation? It kind of works. We are all definitely variants of the human race, and the term can indeed encompass everything from a facial birthmark to someone with glasses, and someone with no limbs, but I suspect it's a term wide open to a charge of "political correctness gone mad". As the academic and broadcaster Tom Shakespeare said when I met to ask his views: "Negative association will pin itself to any word. Changing parlance will do nothing if there is not a shift in attitudes towards disability". This will undoubtedly take more than the evolution of words alone, so for now I'm sticking with the d-word.